This is the "flag-ship" periodic publication in our hobby. I have always loved this magazine, but when I lived in Brazil it was too expensive to buy it every month. Now that I moved into the USA I immediately subscribed to it, and it has been one of my favorite late night readings. Just about all the top names in the hobby publish here regularly, and most articles go into an unmatched depth that'll make you say WOW if you have a good enough background in the hobby, or give up reading if you don't. The photographic quality is spectacular, and it has a very good balance of topics, covering all the different aspects of our hobby. IMO it's worth every penny you pay for each issue, and then some. While I enjoy this magazine, I feel it's a bit too stuffy. It's almost like it takes itself too seriously. I have purchased individual issues of the magazine, but can't see myself with a subscription any time soon. It is a very informative magazine, and goes beyond basic information, which is always nice. The pictures are almost always outstanding, and the articles are well-written. It is a magazine for the serious hobbyist, and that's part of the problem. I would enjoy it much more if it would loosen up a tad. The best fish magazine I have ever purchased. I get mine at Barnes n' Nobles every month and REALLY like the Mail Call and Ask Jack solution. I guess the only reason I'm not interested in Salt Solutions is because I've never kept a marine tank! This is an awesome magazine! I have a subscription and can't get enough of it. I love most of the articles, even if I have never even thought about keeping that kind of fish/invertebrate/other thingy. I just got the magazine with the new format, and now it's, well, bigger, 9 by 10 7/8 inches to be exact. I would recommend it to any serious fish keeper! Overall, this is a very informative piece of work. The only thing undesireable about it is the millions of advertisements. Although, people gotta make money, so you get used to them very quickly. This magazine is almost a must for anyone who is serious hobbyist. It is world renowned and for a good reason. I seriously hope you will invest in this magazine...it's well worth the money. I have read this magazine for over 3 years. 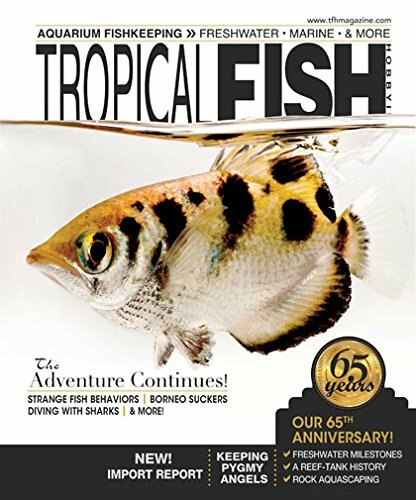 Practically everything I know about fishkeeping is from this magazine. It's great for beginners and advanced hobbyists alike!